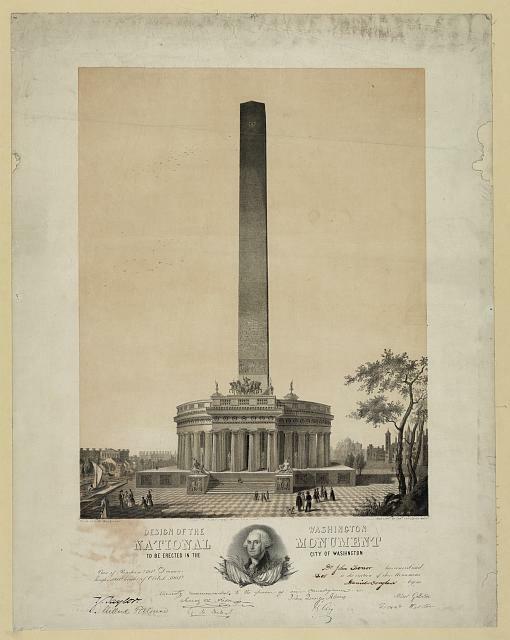 Washington National Monument Society, “Washington National Monument Society,” Histories of the National Mall, accessed April 23, 2019, http://mallhistory.org/items/show/148. Formed in 1833, the Washington National Monument Society took charge of creating a memorial to George Washington on the National Mall. They raised money through public donations and awarded the design contract to architect Robert Mills. In 1854, Congress transferred the land on the Mall to the Society and the Monument cornerstone was laid in July of that year. The Society quickly ran out of money, however, and fundraising campaigns were unsuccessful. The Society returned the land and the unfinished monument to Congress in 1876, then serving as advisors to the Congressional committee charged with completing the Monument. Although people had discussed the idea of a monument to George Washington since 1783 and especially after his death in 1799, nothing had been built as his 100th birthday approached in 1832. A group of Washington citizens came together to form the Washington National Monument Society with the intention of finally moving forward with a monument. The original Board of Managers were Daniel Brent, James Kearney, Joseph Gales, Joseph Gales Jr., William W. Seaton, George Watterston, John McClelland, Pishey Thompson, Thomas Carberry, and Peter Force. They solicited donations from the public and had raised $28,000 by 1836. From 1836 until the mid 1840s the Society held a design competition where American artists and architects could submit their ideas for the monument. They settled on a design by Robert Mills. In 1854, Congress transferred the land on the Mall to the Society so it could being construction, and the cornerstone was laid in July of that year. By 1854, however, the Society had run out of money. Attempts to raise funds from public donations or a Congressional appropriation met with little success. As the national centennial approached, pressure increased to complete the monument. Finally, in 1876, Congress passed a joint resolution taking charge of the completion of the monument. The Society ceded back the land on the Mall and acted as advisors to the Joint Committee in charge of completing construction. They helped review a number of proposed completion designs but ultimately decided on the obelisk we have today. The capstone of the monument was set in December 1884.